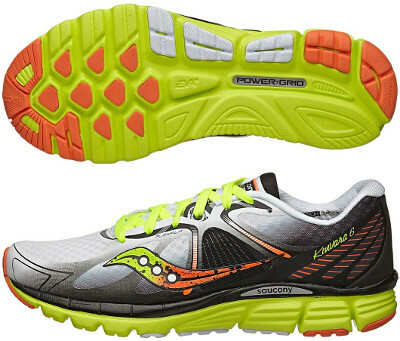 Saucony Kinvara 6 are neutral performance running shoes. The Saucony Kinvara 6 is one of the most popular shoe among neutral runners looking for great blend of lightness and cushioning. With its well known 4 mm drop offset it promotes a natural running experience delivering a solid responsive ride for speed workouts and racing from 10k to marathon. There are no major changes but minor updates in current version from its predecessor the Kinvara 5. The new breathable mesh is simpler after removing few overlays and midfoot fit is secured with Pro-lock™ strap through conventional lacing. Rest of Kinvara 6 keeps same features with full length PowerGrid™ foam on top of EVA+ to provide a durable and responsive cushioning in the midsole for great comfort. Saucony has released special editions of the Kinvara 6 to celebrate some of the most popular marathons around the world: the Kinvara 6 Boston and the Kinvara 6 London.